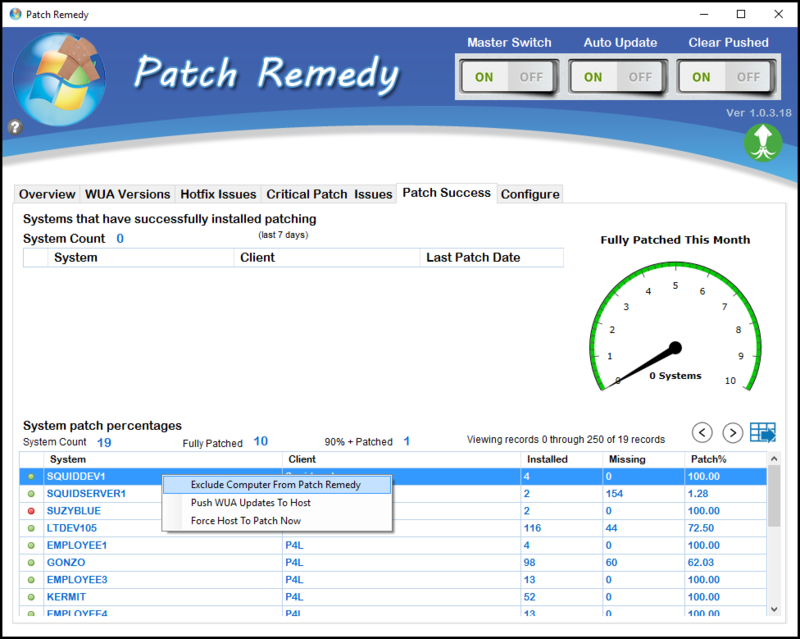 Patch Remedy is a tool used to help manage the Windows Update Agent. Microsoft’s Windows Update Agent (WUA) is an agent program that works in conjunction with Windows Server Update Services to support automated patch delivery and installation. Labtech uses this agent to help determine what patches are needed by each Windows system and deploys them. 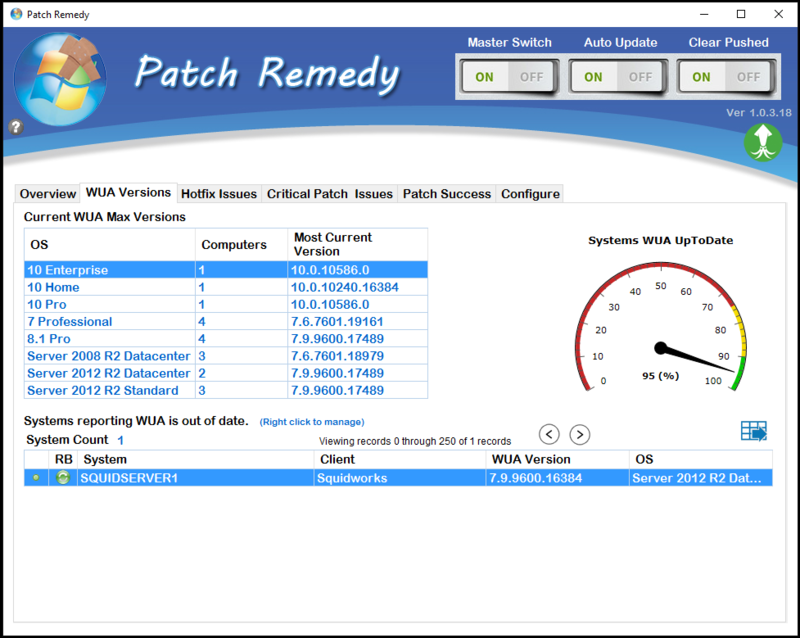 Microsoft often updates the WUA which increases the detection of missing patches more current than the installed version of WUA. This can cause you to get a perception that your patching is up to date when in actuality you are massively behind. 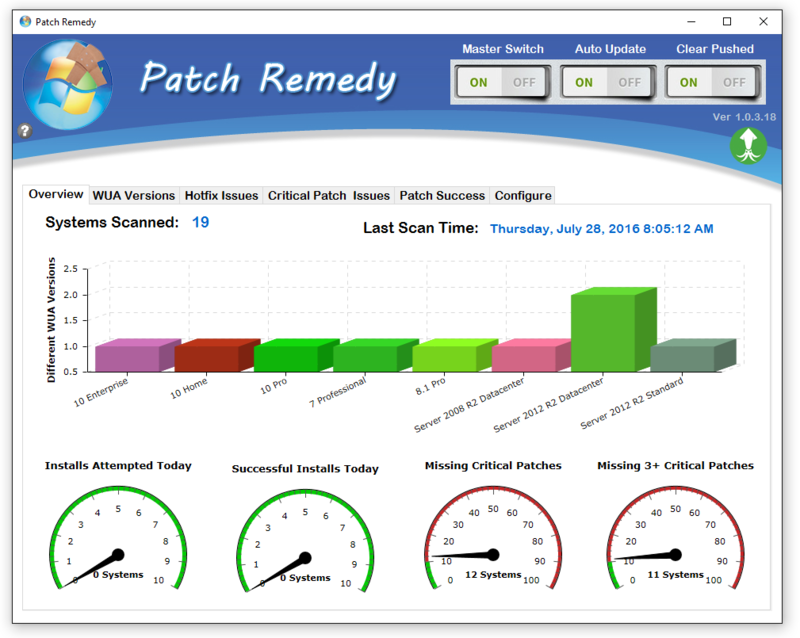 That’s where we come in, Patch Remedy automatically scans all windows systems for their current WUA versions and OS type and stores that inside LabTech. It uses that information to perform automated updates of WUA for Windows 7 and 2008 R2 systems. It also takes a look nightly at the number of recent failed hotfixes and updates. We offer several manual tools to help manage problems seen with WUA. There are several lists of data about how WUA versions are deployed across your environment. In these lists you maybe able to operate functions to resolve common issues with WUA. There are 2 types of repair for WUA, Normal and Aggressive and there are 2 types of Updates for WUA, Latest and KB3083324. Repairs: (Normal and Aggressive) Based on KB971058 https://support.microsoft.com/en-us/kb/971058. Latest: Can be run on any Windows 7, 8, 2008 or 2012 system and will attempt to update the WUA to the most current versions available. This update is run silently and with the /noreboot switch so should be safe to run at anytime without affecting end user. We have several automated tools to assist with keeping WUA up to date and the patch push status cleared on over attempted patches and hotfixes. Clear Pushed: The “Pushed” status for a patch means that LabTech has tried twice to install the patch and it didn’t succeed, so it’s not going to try to install it anymore. This function will clear the “pushed” flag from [hotfixes] out so that LabTech may reattempt them. We also provide some insight into what is going on with WUA so you can visually see problems with your WUA environment. Get graphs and charts that show the different deployed versions of WUA and how effective your patching is. Patching alone is not going to keep your clients up to date, adding Patch Remedy to your LabTech patch management system will improve your numbers hands down. Get the most out of your LabTech system with Patch Remedy. The automated services are on a 4 times a day schedule of 8 am , 12 pm, 4 pm and 8 pm. After installing the plugin and restarting the DBagent service on the LT server you will need to allow time for this service to kick in and run the scans. Once completed you will see the data in the plugin. The plugin has a master off switch that you will need to turn on before scans will start. you can use this switch to turn off all automated functions on this plugin if needed. We have added some basic permissions to the plugin. Super Admins and “Patch remedy” class users can open and manage the consoles. Add the User Class “Patch Remedy” to any user in Labtech to allow them access to the management console. Hi all, just FYI this will be under the Tools Menu in LT. Took me a few mins to find it as most of the plugins show under the View menu..
Any chance at all in future versions to enable this at a client/location level? We’d love to be able to schedule scans/repairs as well. Also, it’d be helpful to be able to filter/export agents on the WUA screen. Thanks for this useful plugin! I am having the same issue as Ian above, in that I cannot open Patch Remedy in the Control Center with a user account, even if that user is assigned the Patch Remedy user class. I have to log in as a superadmin for it to work (which I’d rather not use regularly). I can’t find this verbiage in any internal monitor, and looks different than built-in Ignite monitors. Any ideas where this is coming from? Excellent tool, I enabled it last night, I can’t wait to see how it improves things! Thanks for this plugin. It has given us an easier way to to identify machines that may not be patching or having issues with patching. Great job on the automation. Is there a way we can export these or filter by company for the devices with failed patching? Is this working for 10.5 yet? Sounds like a great product, I decided to try it but getting an error that an unhandled exception has occurred (inpute string was not in a correct format.) using Labtech 2013 control center v60.276. I can continue to launch the Plugin but it doesn’t show any information inside the plugin so not sure that it’s working. Is this a known issue and any plans to get it fixed? It works for me, but it shows up under “View” instead of “Tools” with 10.5. I’m not sure it works or was intended for LT 2013. Thoughts on when we will see the latest version of this and what pricing will be? Works in 10.5, but does show up under view. We had issue loading the .dll, but if you go to properties on the .dll and near advanced, click unblock, then you can load the .dll. Took screenshots of our current patch health, so I’m excited to see how things will look on Monday when all of our sites have ran all their patch schedules, etc. Also curious of when/if WUA 7.6.7601.19077 will be implemented. Thanks Ian. Is that from Microsoft or Patch Remedy? I was asking more about how do I know what version Patch Remedy is currently pushing as this article indicates that Auto Update does the following: looks for online systems that have earlier versions of WUA and tries to update them to 7.6.7601.18979. SquidWorks replied and let me know that the latest version is 1.0.2.56 and pushes the latest WUA. You can confirm this by looking at WUA versions tab. Is this something that should be installed on my server? I am new to labtech and the patching is so much more convoluted than in our old RMM. I am trying to get a good indepth handle on the patching, and so far this looks like a better way to view my status. FYI, I haven ever installed a plugin that was not in our original install. Like I said very Green in The LT Product knowledge. Is there a “user manual” anywhere? I have read the basic quick start, and have been running it for a week or so, and it has improved the patching stats, but it would be nice to know what the columns represent, etc. Our firm started using this a bit over a month ago. We are thrilled at what it’s fixing. It is saving us so much time. Love this LT add-on! I am actually pleased to read this blog posts which includes tons of helpful data, thanks for providing such statistics.